The Davis Horse Boot is ideal for continuous soaking when conditions such as abscesses, thrush, puncture wounds and other aggravated foot conditions exist. 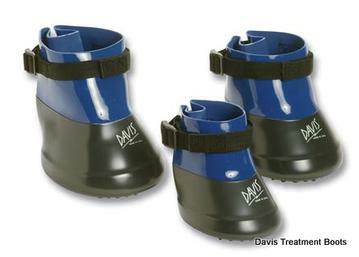 Davis Manufacturing has developed a new delivery system for treating infections of the sole, frog and hoof wall. The secret is the addition of a new pad that fits into the Davis Horse Boot with new fiber matrix technology. When saturated, the pad wicks the ingredients to the affected area of the hoof without spilling or running, making the technique safer and more effective than most other treatments because it promotes a much longer contact time with the hoof without harming hoof tissue. Size 00 (Mini Horses and Foals) to Size 6 (Draft Horses) To determine correct size, please refer to the sizing chart below. **Note: These dimensions are based on the inside of the boot. Colors: Two-tone Blue/Gray combination only.